We have production facilities to manufacture a large range of flat springs, clips & pressings from flat and square section material. 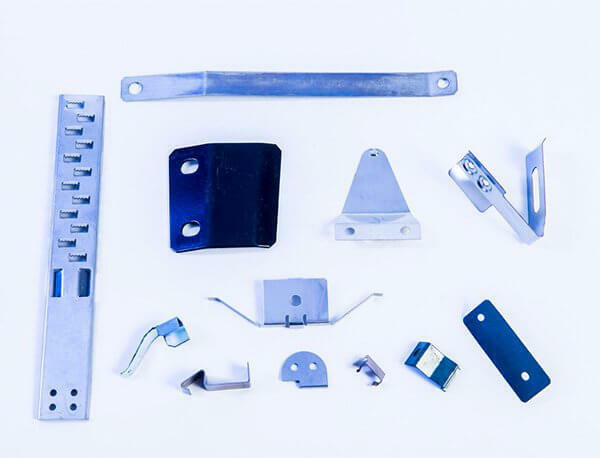 Flat springs, clips and pressings can be manufactured from a wide range of materials to suit their design and functional requirements. Annealed carbon steels are relatively easy to form but usually require hardening and tempering after forming, this may cause distortion of thin or complex components. Carbon steels may also require corrosive protection i.e: plating or oiling. Stainless steels avoid the need for corrosion protection and hardening and tempering. Bi-directional bends in stainless steel are limited due to grain direction within the material. Conventional blanking operations may form a burr which can be removed by mechanical deburring operations. Small or delicate components may not lend themselves to this type of process, and consideration needs to be given at the design stage to the effects burrs might have on the function of the component. We do have experience in the force testing of flat springs using jigs and fixtures. Calculating of force is a very lengthy process and in many cases force requirements can only be verified by prototype production and testing. Our team are able to produce small sample batches of components ready for testing before resorting to the production of expensive tooling for bulk production.